Summer dreaming : [eScore] / by Glen Carter-Varney. The music is sectional and flows through various musical ideas moving smoothly from one to another in a pleasant dreamy mood in the warmth of summertime. Score: Summer dreaming / by Glen Carter-Varney. 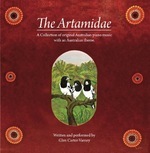 CD: The artamidae : a collection of original Australian piano music with an Australian theme / written and performed by Glen Carter-Varney.